And David Frost, son of a band member of the time, writes to us on 6th October 2010. I was 'surfing the net' this evening, peering into the past and it occurred to me to check on the Crystal Palace Brass Band. My own memories of the band are limited to childhood in the fifties when I used to sit in on practices attended by my father and grandfather. 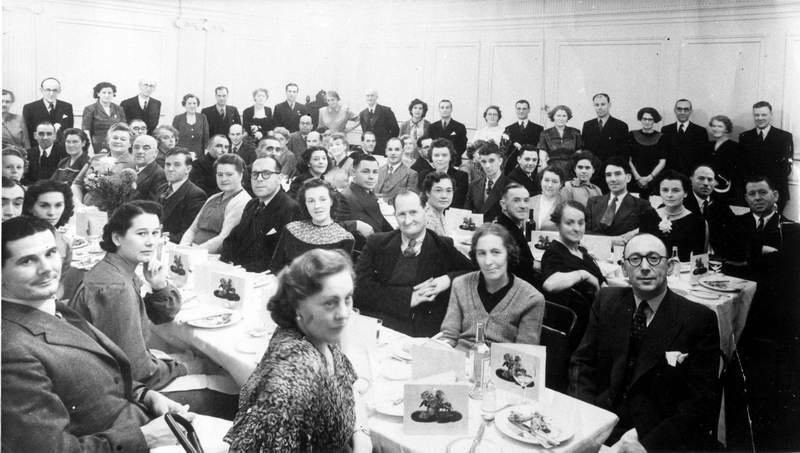 I can identify them in the 1950 Jubilee photograph. The younger couple standing at the back (almost in the middle) are my parents Theodora Frost and Amos (Sunny) Frost. Sitting at the table in front of them (but facing the camera) are my grandparents Amos Kemble Frost and Beatrice (Beatie) Frost. I was born in October 1950, so this would have been one of my mother's first outings after giving birth to me. Unfortunately I do not recognise anyone else in the photo, My Dad and Grandad both played trombone. I did not inherit their musical talent, but my family ancestry research indicates that there were professional musicians in the family, on my Great Grandmother Richards' side, going back to the early 1800's.